Designer Joe Weishaar and sculptor Sabin Howard crafted a design that connects World War I to current and future generations. The World War I Centennial Commission in Washington, D.C., announced January 26 that Joe Weishaar and Sabin Howard were the winners of the two-stage World War I Memorial Competition. 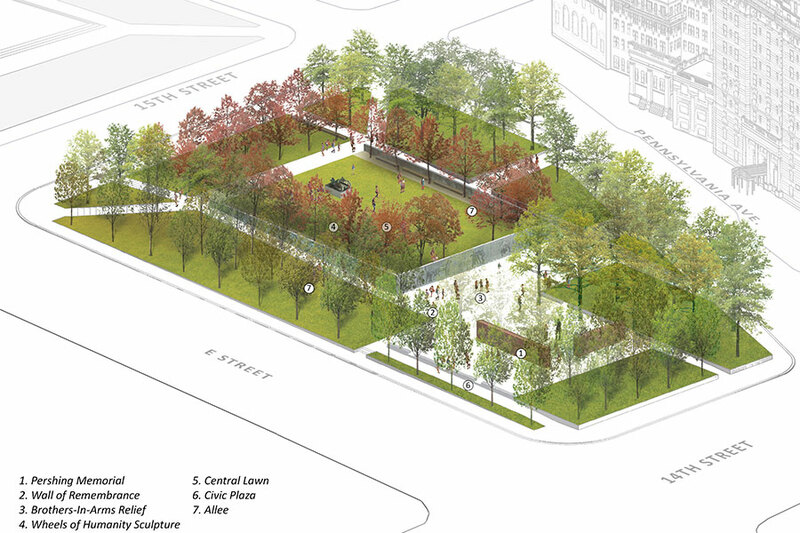 After soliciting proposals to design a national WWI memorial for Pershing Park, the commission received 360 entrants, which were narrowed down to five in August 2015. The park was designated as a National WWI Memorial by the federal government in late 2014, but the park has not been redeveloped to reflect this new designation. Weishaar is a young designer currently working for Brininstool + Lynch in Chicago. A recent graduate of the University of Arkansas at Fayetteville with a Bachelor of Architecture, Weishaar is still working toward his licensure. Baltimore-based GWWO Inc. will act as architect of record as the project is refined. For those noting Weishaar’s young age—he is only 25 years old—it should also be noted that Maya Lin was only 21 years old when she designed the Vietnam Memorial, one of the nation’s most visited memorials. Howard is a New York–based classical sculptor who studied at the New York Academy of Art. The frieze he developed with Weishaar will include a diverse set of scenes from the frontlines to the efforts on the home front. In order to complete the planning for the piece, Howard worked with models in authentic World War I uniforms. 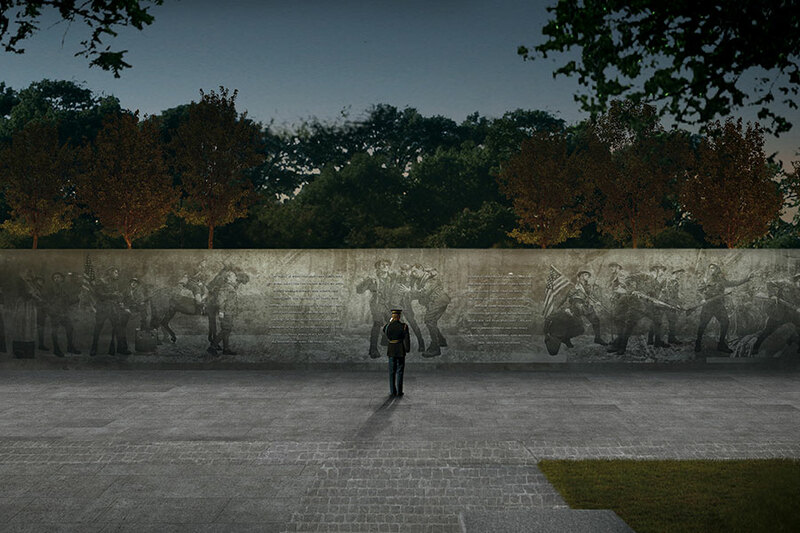 With relatively few images of the war, Howard and Weishaar worked to compose a long narrative of the war that is read as visitors navigate the memorial. The four other shortlisted offices included proposals ranging from contemporary rectilinear concepts to a neoclassical design reminiscent of a triumphal arch design. Each one was guided by ten design goals set forth by the World War I Centennial Commission. These included guidelines addressing enclosure, access, contextual considerations, and sustainability. The negotiation of what to do with the current park amenities and memorial was left up to the participants to address. 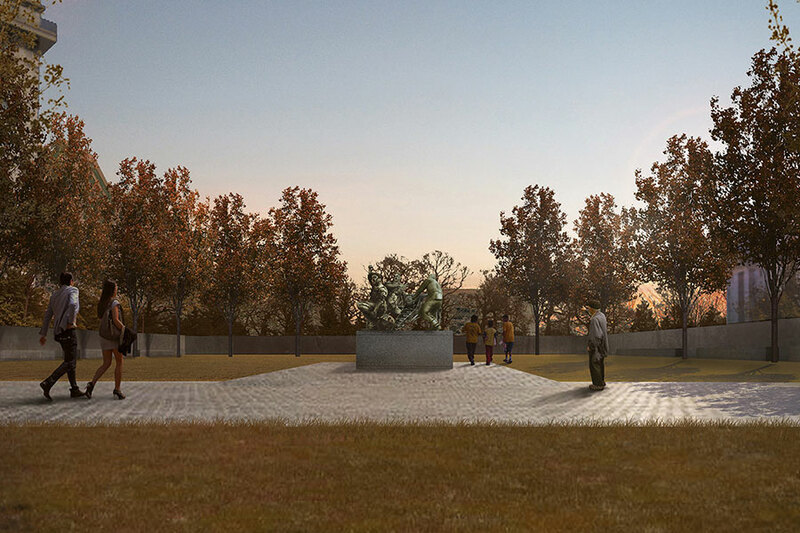 The winning design proposes to keep the current General Pershing monument as it stands. Though the park has already been designated as the National WWI Memorial, the park itself has also recently been named as being eligible for listing in the National Register of Historic Places by the National Park Service. If the park achieves this designation, there would be a foreseeable conflict of redevelopment as the project attempts to move forward. The park’s current configuration was designed by landscape architects M. Paul Friedberg and Oehme van Sweden & Associates.